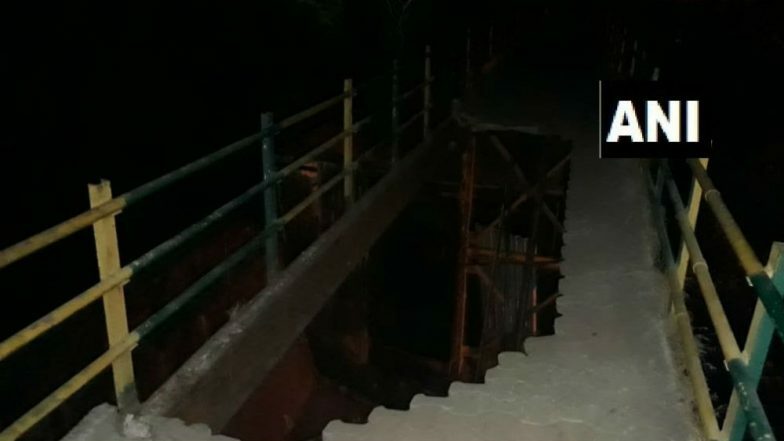 Mumbai, April 11: In another incident of footover bridge collapse in India's financial capital Mumbai, two people sustained injuries after a part of footover bridge in Sagar Vihar of Vashi area in Navi Mumbai collapsed on Thursday evening. Mumbai Foot Over Bridge Collapse: 5 Dead in CSMT Station FOB Collapse; Here's A Look At Similar Recent Mishaps in The Maximum City. The injured have been admitted to a nearby hospital. Though the nature of their injuries have not been known. Andheri Bridge Collapses Update: 5 Injured as Part of the Gokhale Bridge Collapses, Western Line Local Train Services Affected. This is the latest incident of footover bridge collapse in or around Mumbai. Recently, the foot overbridge collapsed in Mumbai’s Chhatrapati Shivaji Maharaj Terminus in March, killing five people. The incident took place around 7:20 pm when around 400-500 people were around the foot over bridge. Many suffered injuries, including nurses working in a nearby hospital. Mumbai Foot Over Bridge Collapse: Here's A Look At Similar Recent Mishaps in The Maximum City. In July, Gokhale Bridge connecting Andheri East to West in Mumbai collapsed. The mishap had occurred near platform number eight and nine of the Andheri station, and the incident had disrupted the local rail services in Mumbai. An inquiry was ordered into the cause of the footover bridge.